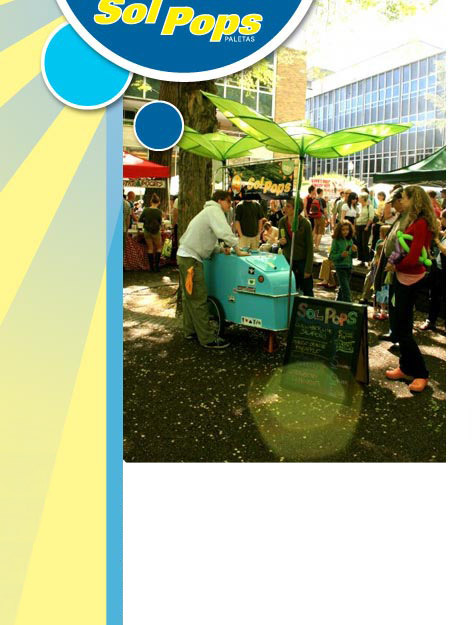 Sol Pops are handmade gourmet and wellness popsicles made in Portland, Oregon. Our pops are sweetened with organic evaporated cane juice, agave, or fruit cider, and we intentionally under-sweeten, using just enough to brighten the flavor of the fruits, vegetables, and herbs. We emphasize local and organic ingredients, and our flavor combinations change with the season. Hot Lips Pizza, Peoples Coop, and the Food Front Coops. © 2009 Sol Pops, LLC. All Rights Reserved. Site design by Spot Color Studio. Hosted by github.